Dimboola is a rural township on the Western Highway, about 300 km north-west of Melbourne. It is 35 km beyond Horsham which is also on the Western Highway. Dimboola is situated approximately in the middle of the Wimmera region, and is on the east side of the Wimmera River near where it divides into several branches. The first white settlement in the area was the Upper Regions pastoral run, and further runs along the Wimmera River and to beyond Lake Hindmarsh were taken up within a year. These settlements attracted an itinerant hawker who in about 1859 set up a general store at Nine Creeks, the original name of Dimboola. Nine Creeks post office was opened in 1863, the same year when the surveyed township was named Dimboola. It is thought that the name was given by the surveyor, after Dimbula in Ceylon where he had lived. The township was at the junction of tracks to the South Australian border, Horsham, Warracknabeal and the northern Wimmera. It became the administrative centre of Lowan Shire (1875) and Dimboola Shire (1885). Much of the district was settled by German farmers from South Australia, establishing Lutheran communities northwards to as far as Pella near the Big Desert. 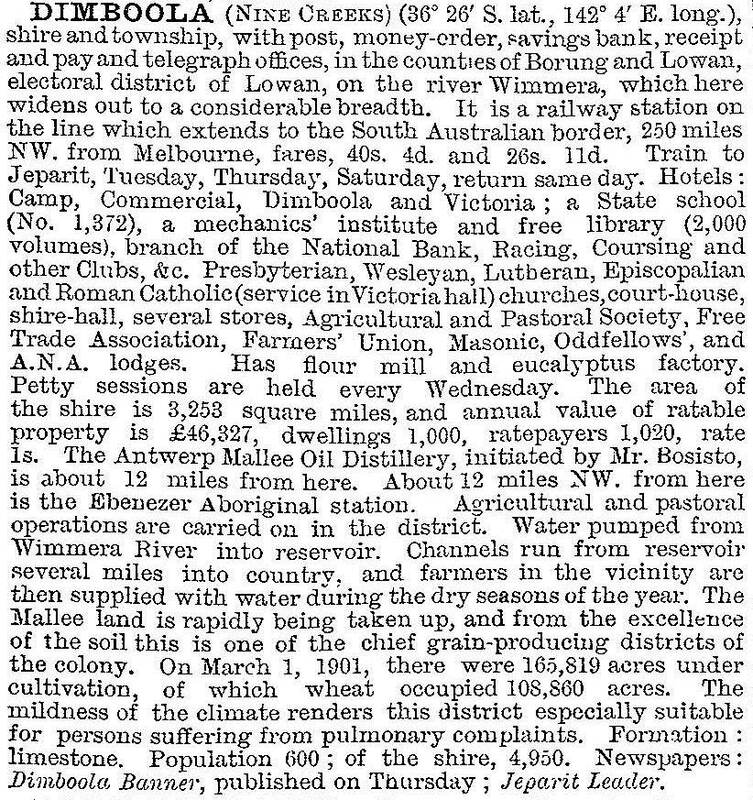 A flourmill was opened in 1876, and in the first issue of the Dimboola Banner (1879) Dimboola was recorded as having three hotels, a bakery, several stores and blacksmith/wheelwright establishments. The town's population was about 100 persons. In 1882 the railway was extended from Horsham to Dimboola, and branched to Serviceton and Jeparit in 1887 and 1894 respectively. The coming of the railway intensified farm settlement: the Mallee vegetation was rolled and burnt, and agricultural equipment was designed to avoid entanglement with unburnt stumps. Some of the Mallee growth was stripped for eucalyptus distillation. Annual shows run by the Agricultural and Pastoral Society demonstrated improved ploughs, cultivators, grubbing machines and strippers. The population of both the town and the shire grew steadily, peaking at the 1933 census. A short distance south of Dimboola a Village Settlement was established in 1895, lasting for about 20 years. The farms were optimistically undersized. The first of three cultural events affecting Dimboola occurred when the author, Nathan Spielvogel, taught at the Village's school and contributed articles to the Dimboola Banner. During the 1920s there was prosperity as increasing wheat yields and good prices brought farmers buoyant incomes. The Star picture theatre and a higher elementary school were opened. In 1930 a grow-more-wheat campaign produced a record harvest, but sold at record low prices. Many farmers survived mainly by self-sufficiency in home production of vegetables, dairy products and cured meat. Depression and war followed. In 1942 Corporal S. Nolan was sent to Dimboola to guard Army and emergency supplies. Entranced by the broad flat landscape, he painted a series of Wimmera and Dimboola works which were later considered to be a major turning point in Sir Sidney Nolan's artistic career. Several of the works are held by the National Gallery of Victoria. The 1950s-60s ushered in a further period of prosperity with increasing wheat yields. By the 1970s the need for farm amalgamations was beginning to be felt. In 1969, however, Dimboola's third and probably most enduring cultural event occurred with the writing and performing of Jack Hibberd's play titled Dimboola. Hibberd was a native of nearby Warracknabeal. A film was later made and premiered in Dimboola. Whilst the depiction of some of the fictitious townspeople was not entirely welcome, the name became a household word. During the 1980s-90s Dimboola has been one of several wheat-land towns gamely hanging on. An ageing population is uncertain about the town and district's future, although the prospect of Dimboola being the gateway to the Little Desert wilderness National Park gives scope for optimism. The establishment of a rail freight changeover facility (1991) was also welcome. The hospital was kept, although partly merged with Horsham's. A highway bypass took heavy traffic out of the town. Dimboola has a large reserve beside the Wimmera River (the site of rowing regattas since 1882), with tennis, bowling and swimming facilities. There are State and Lutheran primary schools, a secondary college, five churches, two hotels, a motel and a caravan park. The Dimboola Banner is published weekly, incorporating the Jeparit News. The mechanics' institute (1877) and one-time Lowan Shire hall are on the Register of the National Estate. The drought during the 2000s caused the Wimmera River to be dry for five years. In 2010 it refilled and Dimboola revived its annual rowing regatta, 121 years since it was first held. In September 2010 and again in January 2011 many parts of regional Victoria experienced widespread severe flooding. In Dimboola floodwater closed the Wimmera Street bridge and inundated farms, the rowing club and houses. Many crops were damaged by floodwaters. An emergency relief centre was established at Dimboola Secondary College.